(from CBS News) AP, SAN FRANCISCO — Another star member of San Francisco’s vaunted defense is calling it a career. 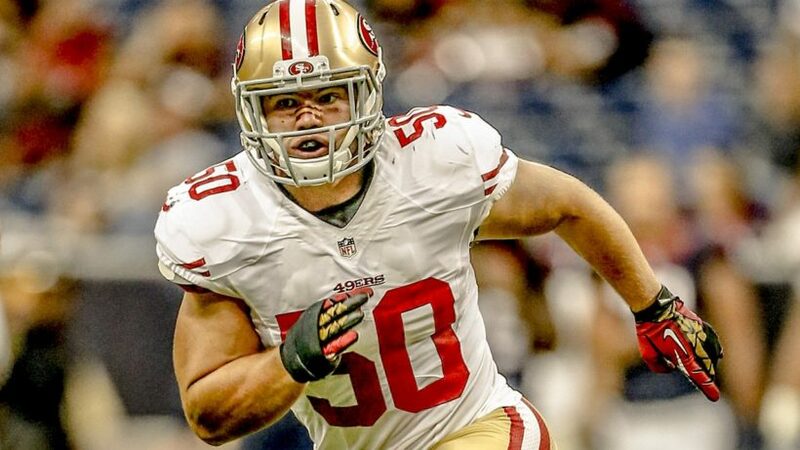 The 49ers announced late Monday that linebacker Chris Borland is retiring after one season, without offering specifics. Borland told ESPN’s “Outside the Lines” earlier Monday that he is retiring following his standout rookie season because of concerns about head trauma. “While unexpected, we certainly respect Chris’ decision,” 49ers general manager Trent Baalke said. “From speaking with Chris, it was evident that he had put a great deal of thought into this decision. He was a consummate professional from day one and a very well-respected member of our team and community. The 24-year-old Borland had a team-leading 108 tackles in his stellar rookie season, emerging as a punishing defender. He also had a sack and two interceptions. Borland is the most prominent NFL player to leave the game in his prime due to concerns about brain injuries, ESPN says. This is yet another blow to the team that lost coach Jim Harbaugh and defensive coordinator Vic Fangio after the season, then watched Frank Gore, Mike Iupati, Chris Culliver and Perrish Cox depart in free agency this past week. Defensive line coach Jim Tomsula was promoted to head coach following an 8-8 season and the franchise’s first time out of the playoffs in four years. Borland’s big announcement comes less than a week after five-time All Pro linebacker Patrick Willis walked away from football. Willis’ retirement didn’t play a role in his decision, Borland said. In a strange twist, Borland is the one who replaced Willis in the starting lineup after his October toe injury that required surgery. The NFC Defensive Rookie of the Month for November, Borland injured an ankle on the final play of the first half against the Seahawks on Dec. 14 and didn’t play again last season. The 49ers selected Borland in the third round of the draft out of Wisconsin, where he was an imposing pass-rusher. “Borland was referring to former NFL greats who were diagnosed with the devastating brain disease chronic traumatic encephalopathy, or CTE, after their deaths. Duerson and Easterling committed suicide,” ESPN says. Borland felt he sustained a concussion during training camp, but continued to play through it. Borland said there’s no chance he would change his mind. 2. Why did Chris Borland make this decision? 4. How did Chris Borland explain his decision? What did he say? 5. In October, the NFL, which for years disputed evidence that its players had a high rate of severe brain damage, stated in federal court documents that it expects nearly a third of retired players to develop long-term cognitive problems and that the conditions are likely to emerge at “notably younger ages” than in the general population. Considering this information, and the fact that he walked away from a lot of money and fame, do you think Chris Borland made the right decision? Explain your answer. In July 2014, months after the Seattle Seahawks won the 2014 Super Bowl Championship, Sidney Rice made a surprise announcement, at the age of 27, that he was walking away from the game after seven years in the NFL. Rice is now speaking openly about the health concerns that led him to retire. In an interview with CBS News, Rice said he had experienced several concussions and would sometimes black out after particularly bad hits. As he spent the off season making his decision, Rice said he was particularly struck by the stories of former NFL players Tony Dorsett and Herschel Walker. “You have these guys that have been going to the same house for 25 years. And all of the sudden they get to a certain point on their way home and they have to call their wives to get the directions home. So that is something that really hit home for me after having experienced so many concussions,” said Rice.